The Cell-Net is designed to better manage power consumption, data delivery information, communication protocols, and system health diagnostics, linking sensor data to information and analysis online via Stevens' Cloud-based software Stevens-Connect. Power Management: Cell-Net offers data buffering and other data management procedures, along with various user-selectable options to help better manage power consumption. Smart Modem features: Easily connect the Cell-Net via serial communication to new or existing systems using Stevens data loggers, or other 3rd-party data loggers / RTUs. 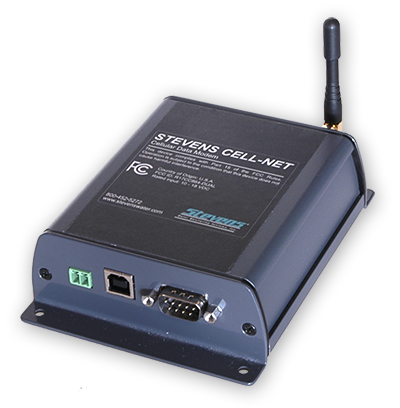 Intelligent data management: Stevens Cell-Net features unique data handling processes to help avoid missing critical data transmissions due to busy cellular networks. Cell-Net offers both CDMA and GSM network support for world-wide coverage in more than 200 countries. Stevens Water is a Verizon Value Added Reseller. For more information on the Stevens Cell-Net, please visit the Stevens Water website or call Stevens at (503) 445-8000.